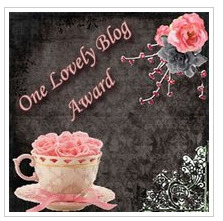 http://www.peskycatdesigns.com/ letting me know that she has given me the One Lovely Blog Award! Thanks a lot my sweety friend Elisa ! I am truly honored to receive this award from such a lovely person. You really must check out her blog, Her blog is very cool and lovely and you can finf her lovely and unique bags there. I look forward to each post. I can not say enough good things about Elisa ,she is lovely , friendly , talented , she is really very nice person. I am living so far , but I am not feeling so far !